When I was first laid off from my job in August I was naturally pretty upset. I liked my job and enjoyed my bosses and coworkers. My schedule was planned out with future vacations and days off in place, and I knew what to expect, Everything was going smoothly. Bam! Reality decided to stop by and introduce me to Life who likes to change things up now and then and remind me that nothing in life is a guarantee and we have to accept change. Thankfully I am a pretty flexible human and I adjusted to unemployed life and began figuring out my next move. Fast forward two months, and I was very fortunate to have found a film industry job at a great company after only being unemployed for a short time. And to top it off with a cherry I didn’t have to start my new job for three weeks. So what do I do with this three week vacation? Road trip, obviously! I hopped a one-way flight to Kansas City on Thursday, September 19th and landed in the afternoon. Then I had four hours to get the rental car picked up and packed up before we were departing for Colorado. My dad, brother and I left at about 6:30pm with the goal of making it all the way to Colorado Springs. We cray cray. BUT we did make it by about 2:30/3am. In a way I was very thankful to drive through Kansas at night…sorry Kansas, but your I-70 stretch is very flat and boring. It’s an eight hour drive to Colorado Springs from Kansas City, and we still had six more hours to go to arrive in Durango (in the far southwest corner of Colorado) so we had to get an early start to our drive on Friday, with no time to explore Colorado Springs. Though we were there during all the awful flooding in the Boulder/Denver/Colorado Springs region and we did see some of the damage while in Colorado Springs. We also had one of the last hotel rooms in the area. That’s why planning ahead is a good idea. 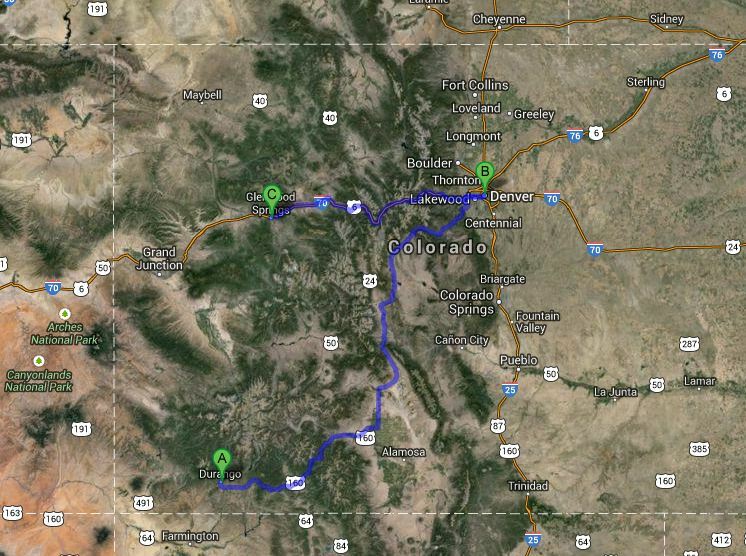 Our route from Kansas City to Colorado Springs to Durango. 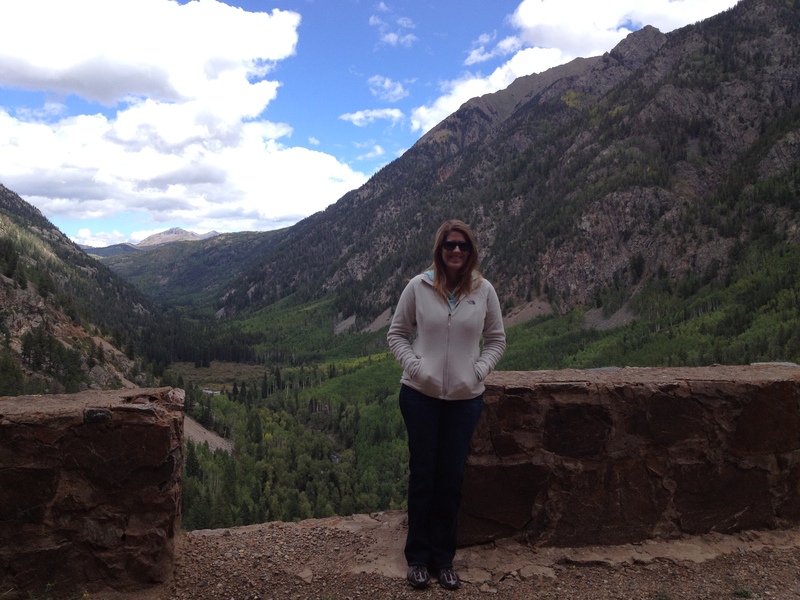 Friday morning we drove through the beautiful and rugged scenery of the San Juan Mountains, the southern range of the Rocky Mountains. 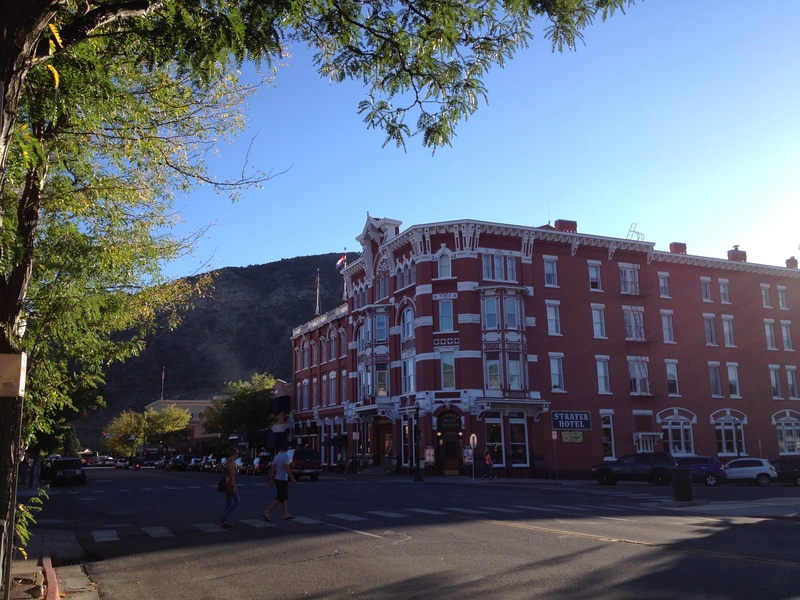 We arrived in the charming wild west town of Durango in the early evening, and after checking into our hotel, we headed downtown for nourishment. We are about to enter the San Juan Mountains! We pulled over to make sandwiches for lunch! 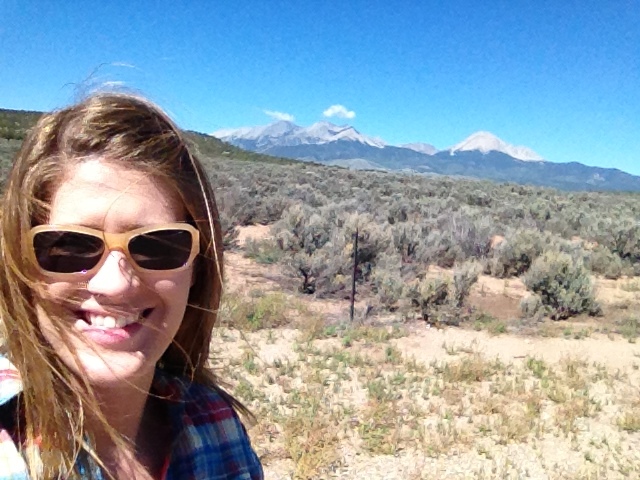 Gorgeous scenery driving in Southern Colorado! 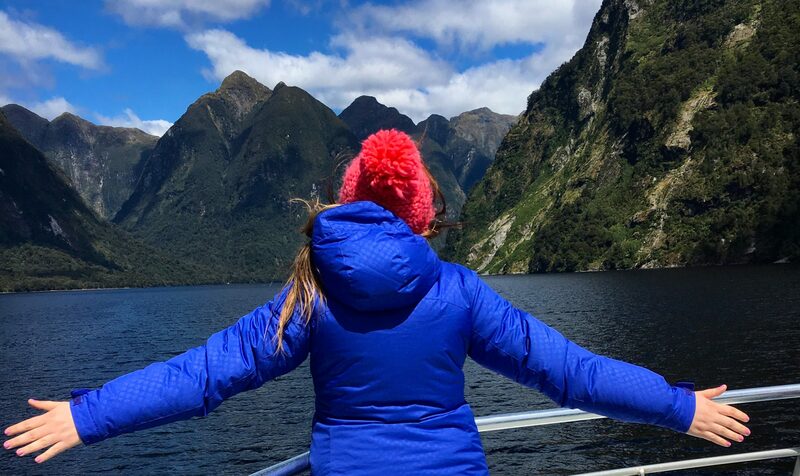 We were blessed with amazing weather on this trip! 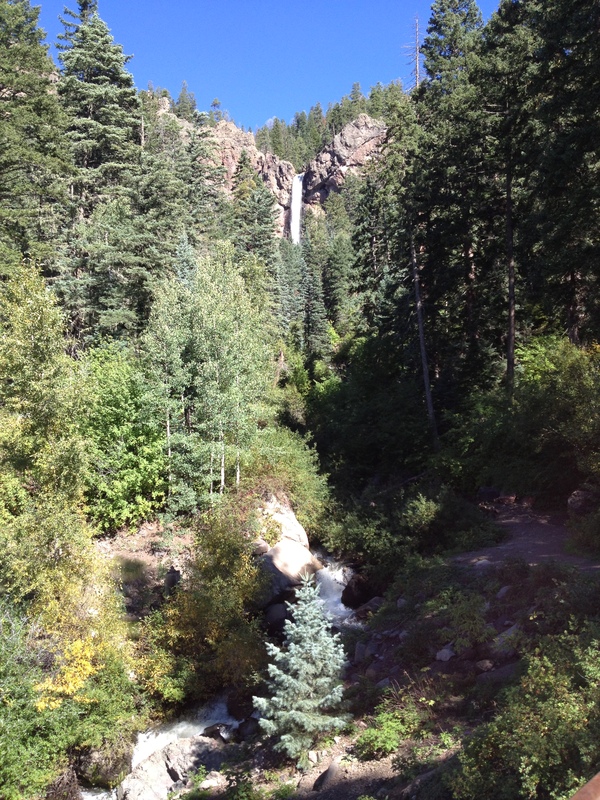 We made a quick stop at Treasure Falls outside of Pagosa Springs. 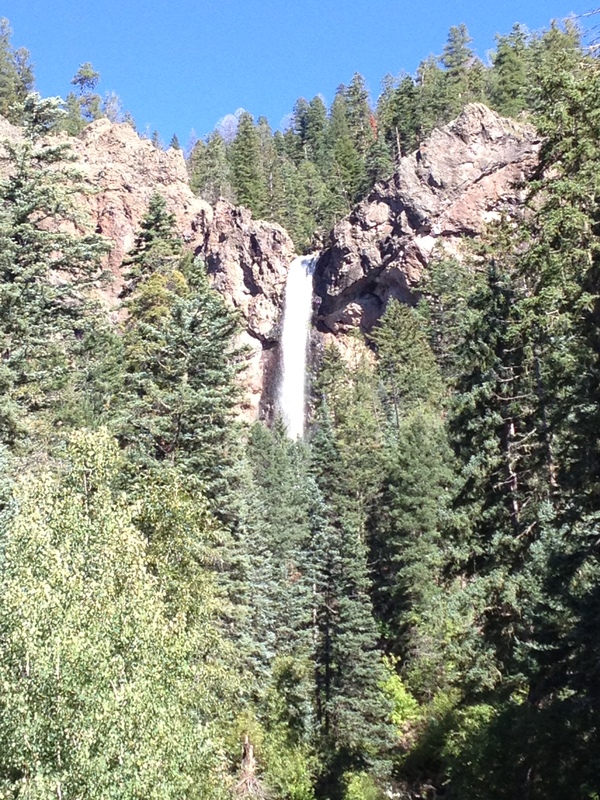 This waterfall is visible from the highway on the way to Durango. I’ve been to Durango once before for a couple days during my move to Los Angeles three years ago. 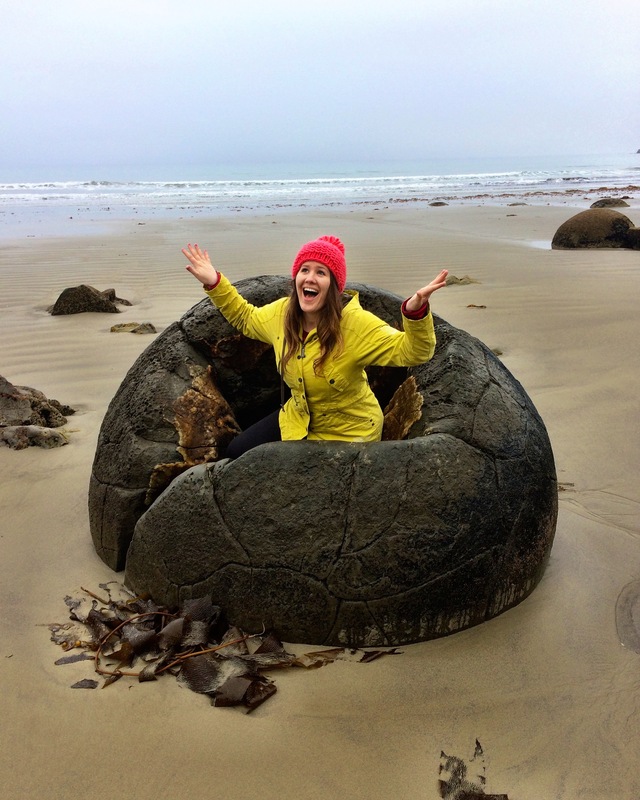 That was another trip that had very fortunate timing, as my best friend Katie was able to join me and we took several days to make the drive to California and turned it into an awesome vacation. 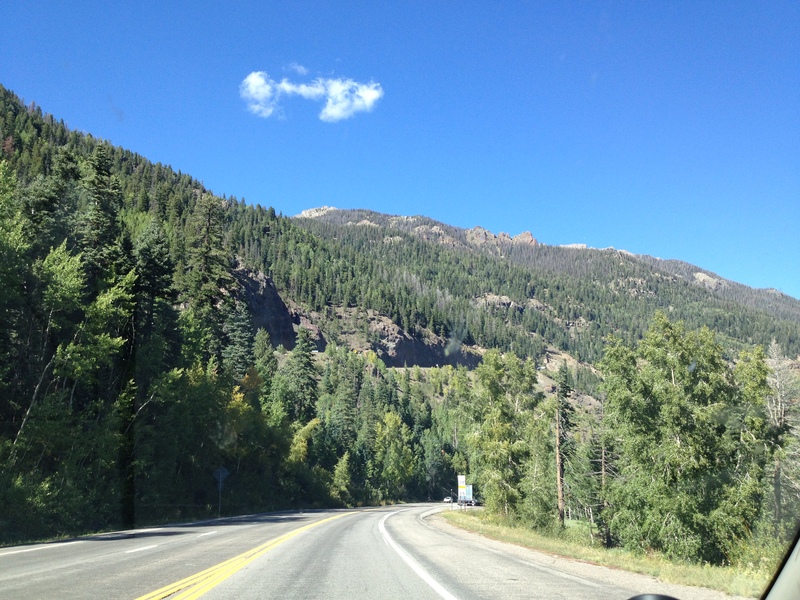 For both of these trips I wanted to take the northern route through Colorado for the more interesting scenery. Though the Southwest has its sites too, I prefer mountains over deserts. 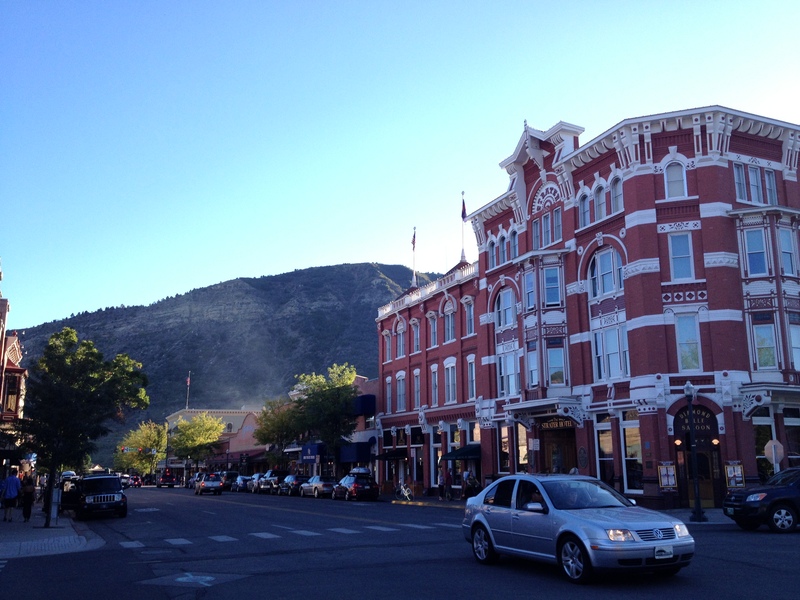 Additionally, I love Durango and was so happy to return to this city. 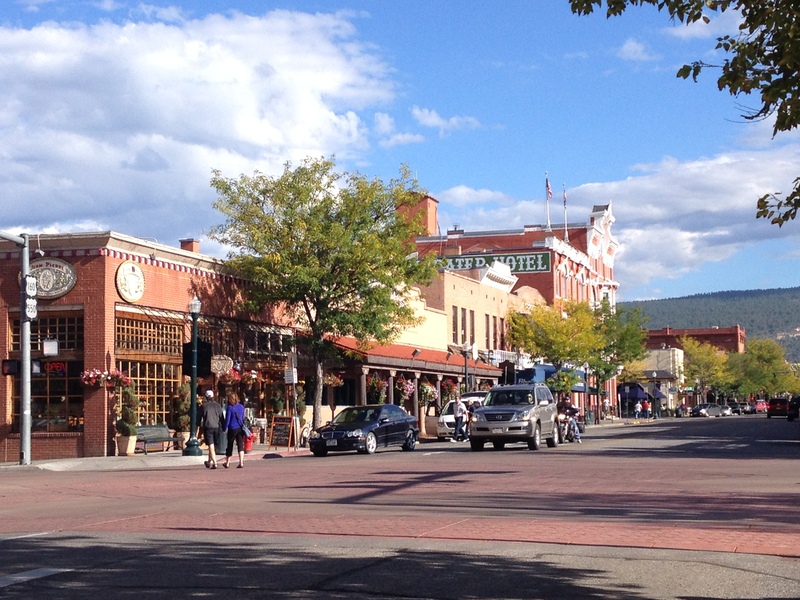 I’m not sure specifically why Durango captivates me so much; maybe its the wild west feel, or the mountain scenery, or the quietness of this charming town, or all of the above. But it’s a great city to visit in my opinion, and I hope to make it back there again for longer than 36 hours. After walking around downtown for a bit, we ate dinner at a local brewery, Steamworks Brewery. My brother says it was the best Reuben sandwich he has ever eaten! 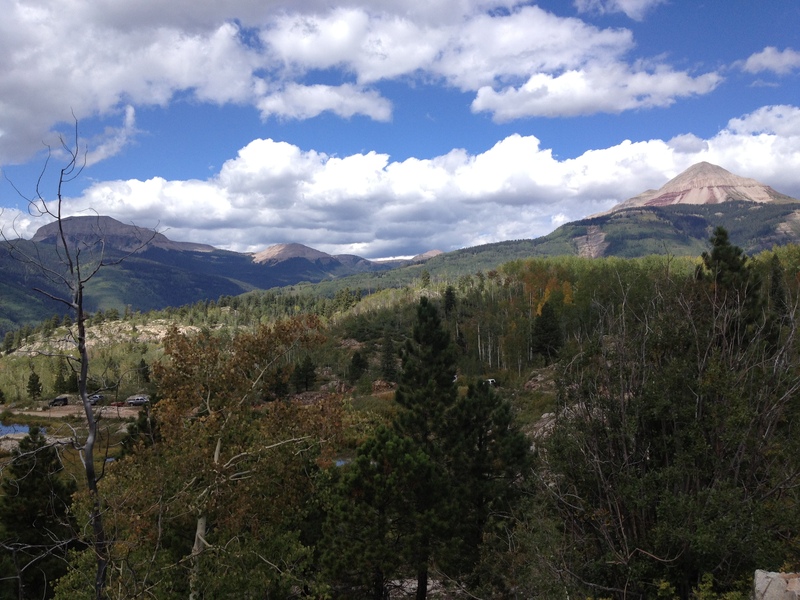 Durango is nestled in the mountains of southwest Colorado. Charming streets full of shops and restaurants. 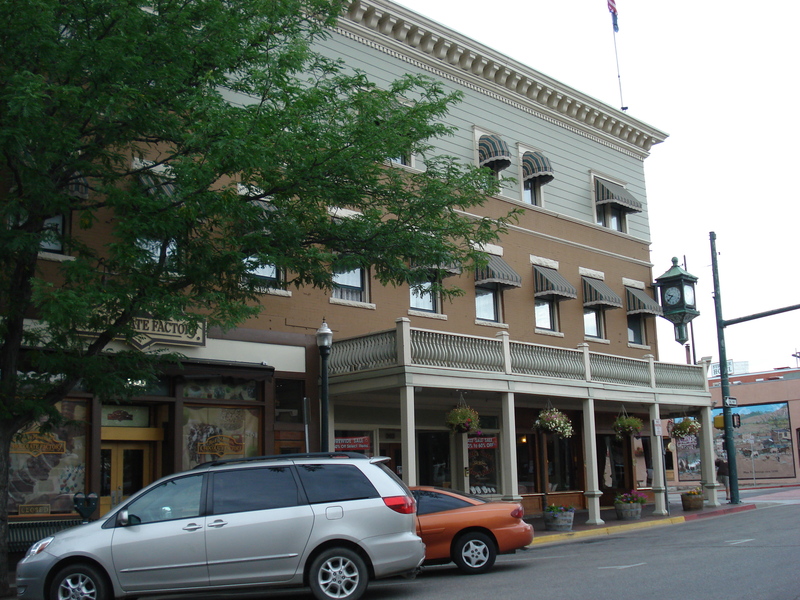 The Strater Hotel built in 1887. 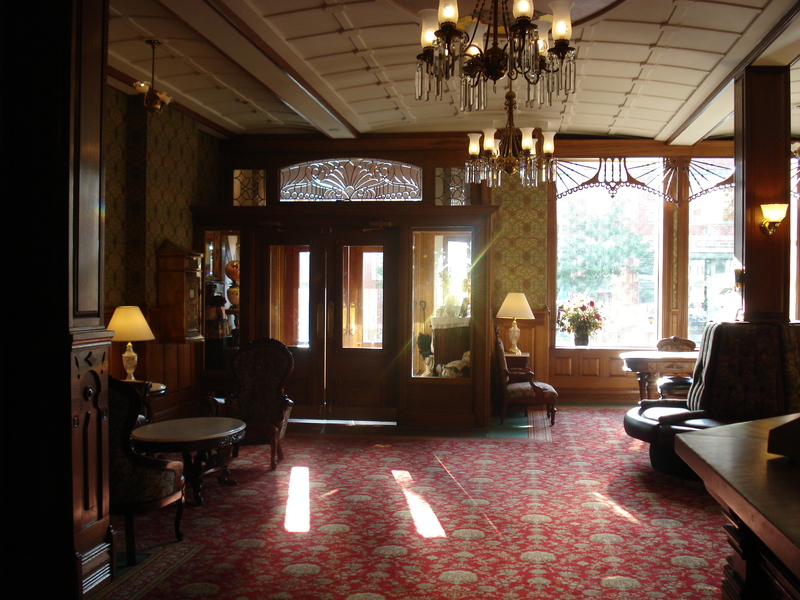 My friend Katie and I stayed here on our first trip to Durango and it was a lot of fun to stay in this historic hotel! 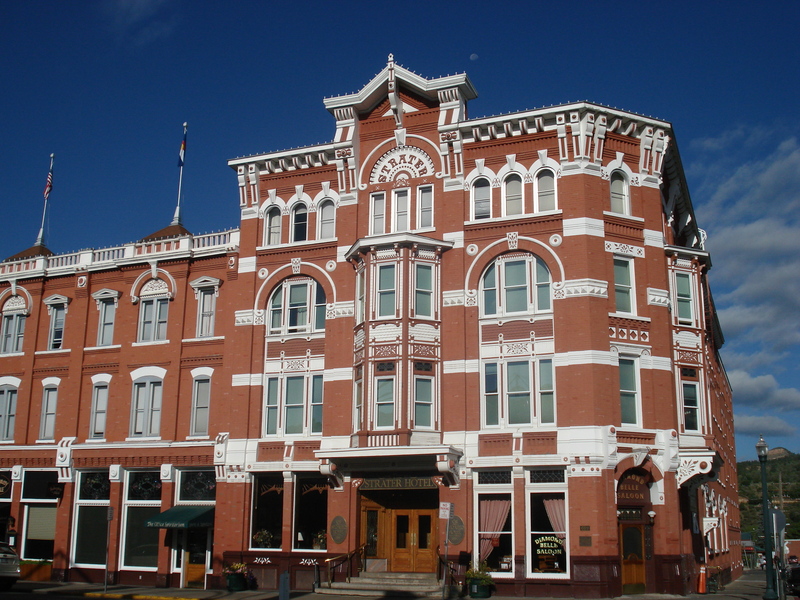 The General Palmer Hotel, built in 1898, is the other historic hotel downtown. I love the historic atmosphere! Saturday morning we dragged ourselves out of bed early (actually that’s a recurring theme of this road trip: early mornings!) 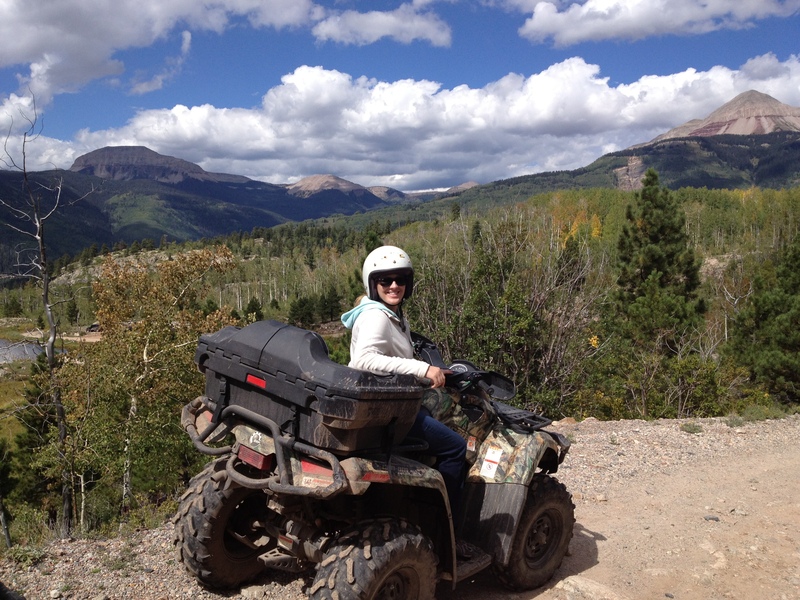 to go four-wheeling in the mountains! 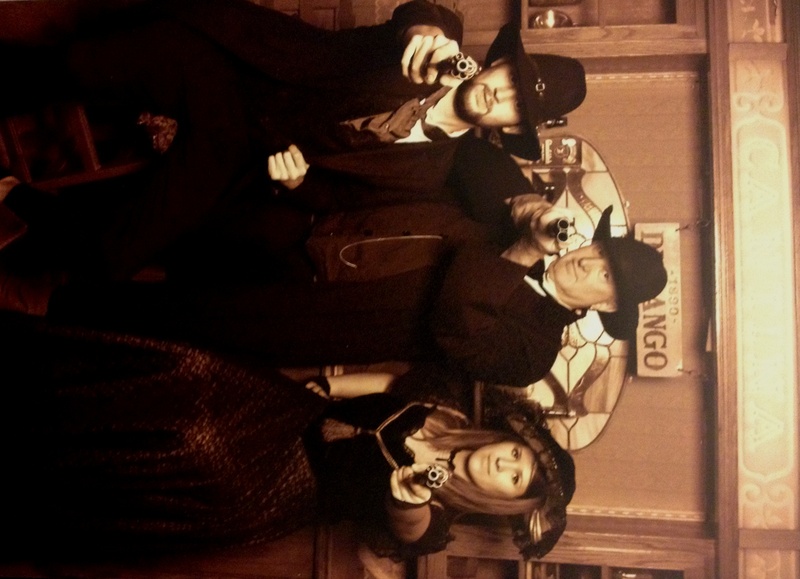 If I had to pick a favorite moment from our entire trip it would probably be this. 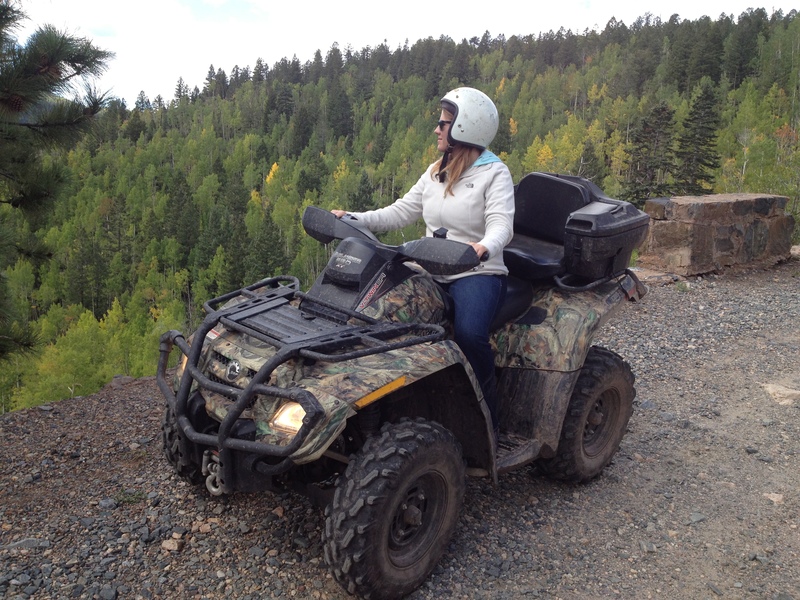 We checked in with Outlaw Tours downtown and then drove about 30 minutes north on US-550 highway in the San Juan National Forest to our ATV starting point. 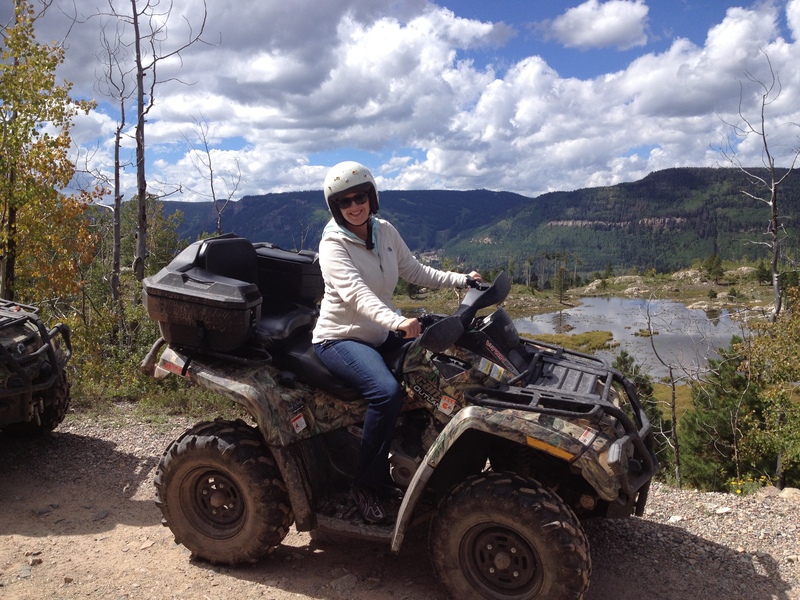 The outfitter guide was very nice and helpful in describing the trail, its sites and history, what animals to keep an eye out for and where are the best spots to see them, as well as instructing us on how to properly drive the ATVs. 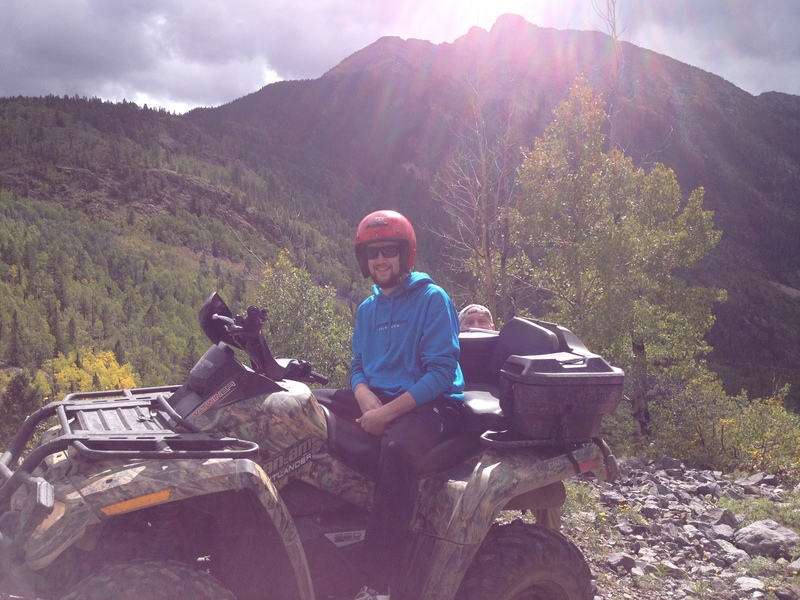 And since we were nice lookin’ folk we got to use their brand new ATVs! We then had 2-3 hours to drive through the mountains and explore the beautiful sites. 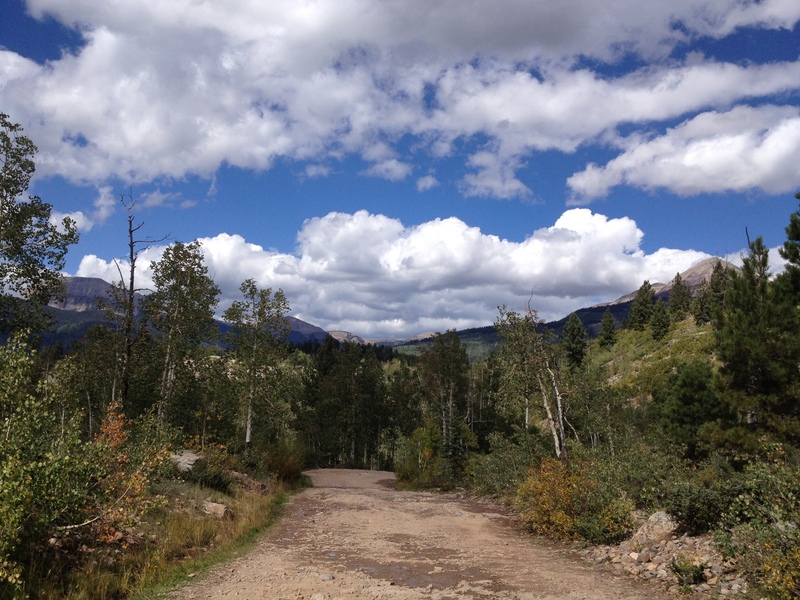 The road we took (Co Rd 1/Lime Creek Road) was the original US-550 and it runs along Lime Creek and connects the Upper Animas River Basin to the town of Silverton. 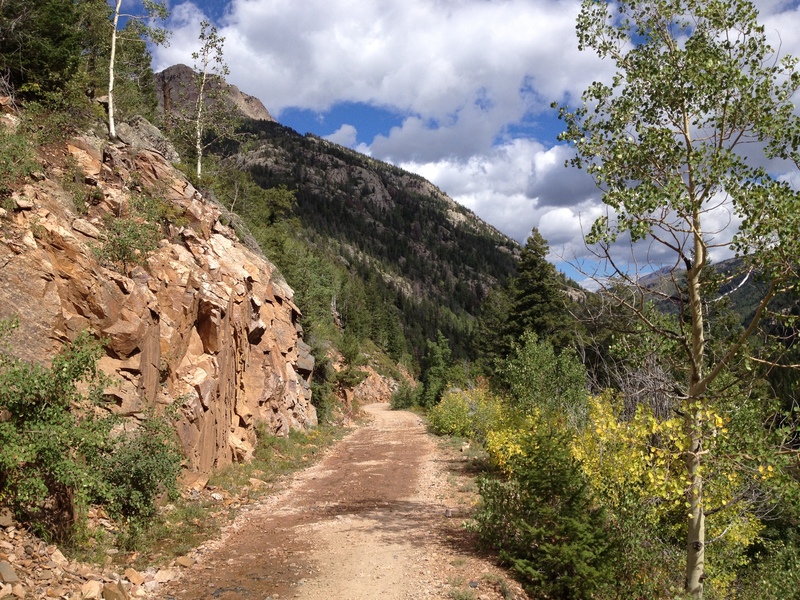 Miners heavily used this wagon trail to carry gold and silver to Silverton in the late 1800s. There were several significant markers on our 2 1/2 hour tour. We first came upon Scout Lake with a view of Engineer Mountain. 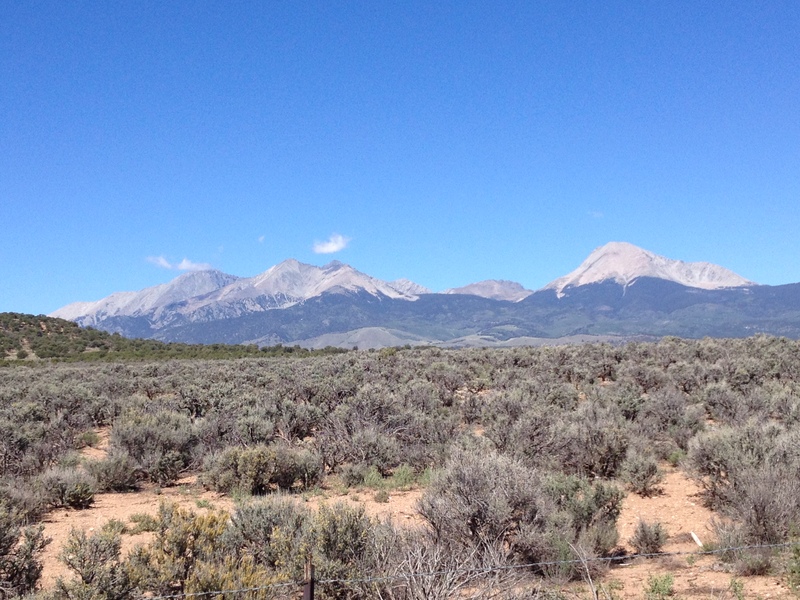 (This nearly 13,000 foot peak was named for the engineers that climbed the summit in the late 1800s to survey where best to lay the roads.) Past the lake the trail becomes a wide shelf road overlooking the Lime Creek Valley. Along this road, we were told to watch for the “china walls”, which are remnants of the rock and brick guard rails that were built by the Chinese workers in the 1930s. The men built the walls to resemble their Great Wall of China. After descending into the valley, there were a couple of campsites along Lime Creek where we could turn around and head back. But since we were the only ATV tour scheduled that day we had more time than usual and decided to take the trail further down into the valley. It was very beautiful scenery! 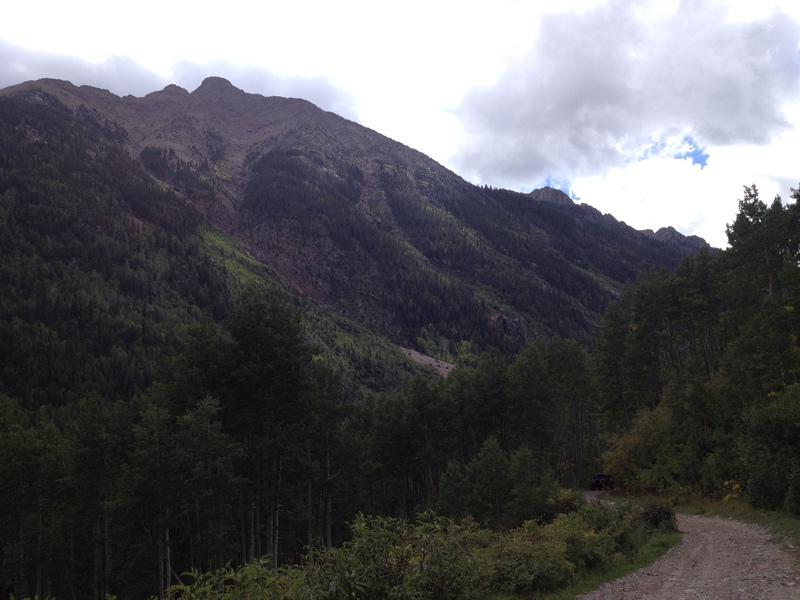 The start of our journey on Lime Creek Road in the San Juan Mountains. 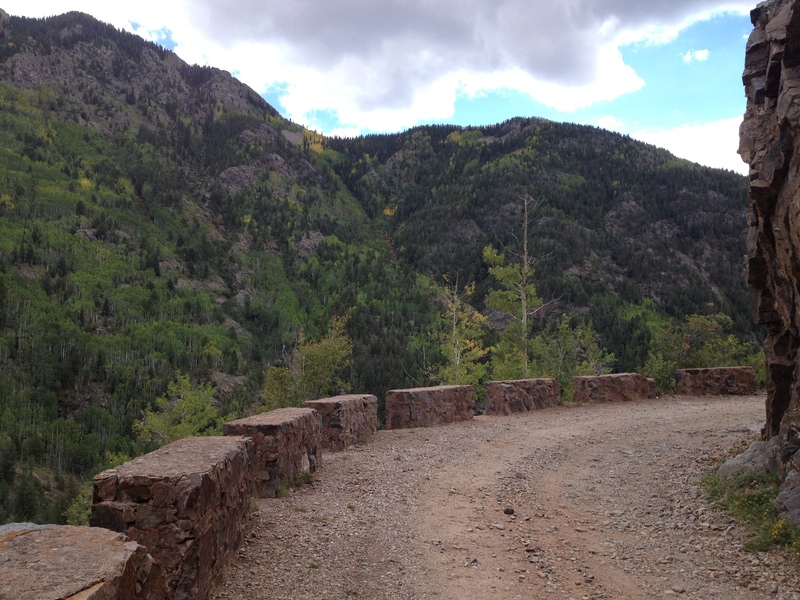 It’s a scenic 12-mile drive on the original Highway 550 between Silverton and Durango. 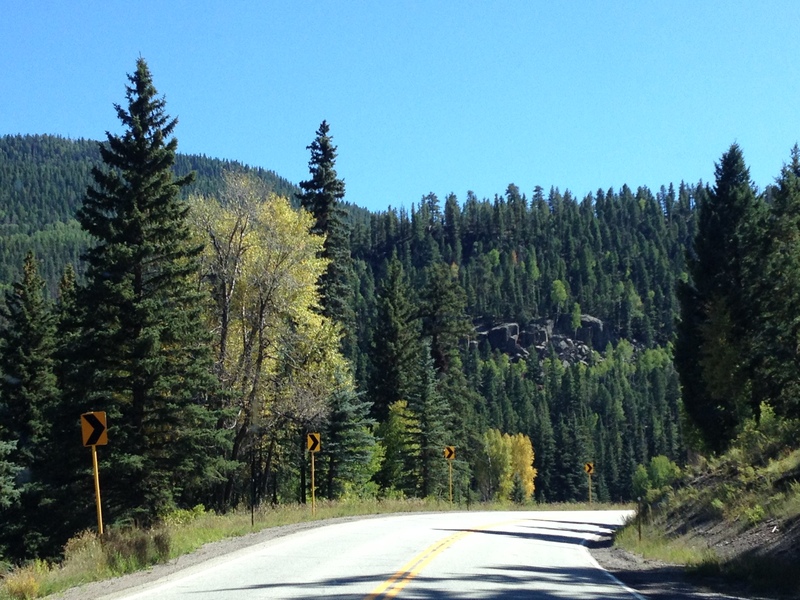 This road is also called US Forest Road 591, and runs through beautiful forestland. Photo op with Engineer Mountain in the background. 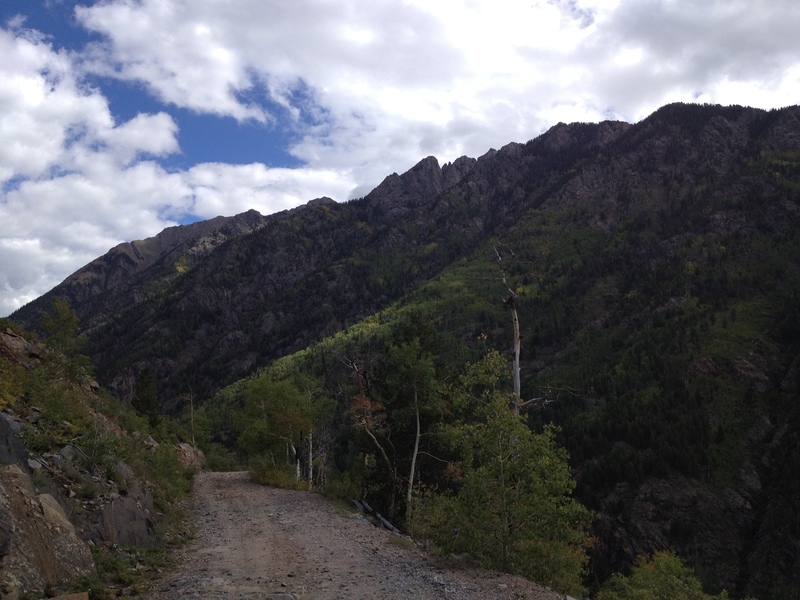 This is a great off-road drive to take and experience the gorgeous views southwest Colorado has to offer! It gets cold quickly in the mountains! We wish we brought gloves! I love the colors of Colorado! It’s hard to believe this road was the original US-550 highway connecting the mining towns. Can you imagine what it would’ve been like to ride this road in a horse drawn wagon? Taking a break to enjoy the scenery. 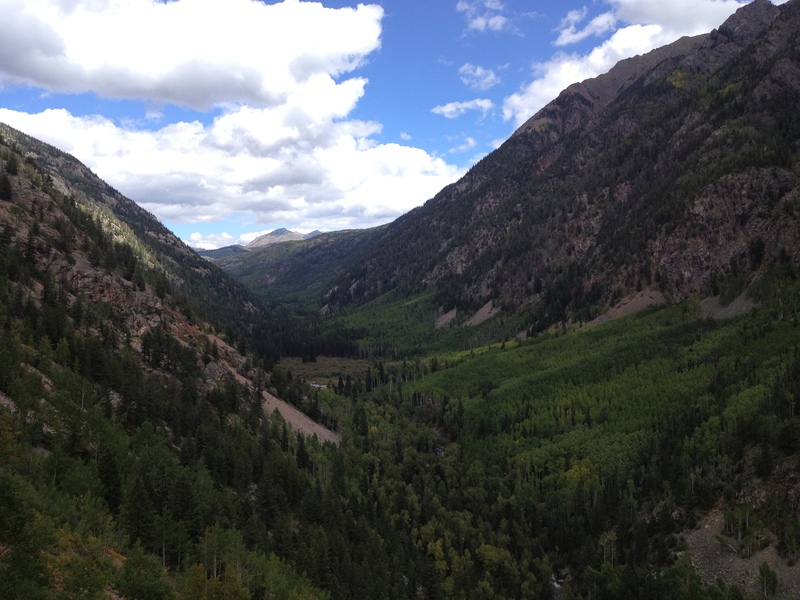 The beautiful valley below that we drove down into. Photo op along the Chinese guard rails. 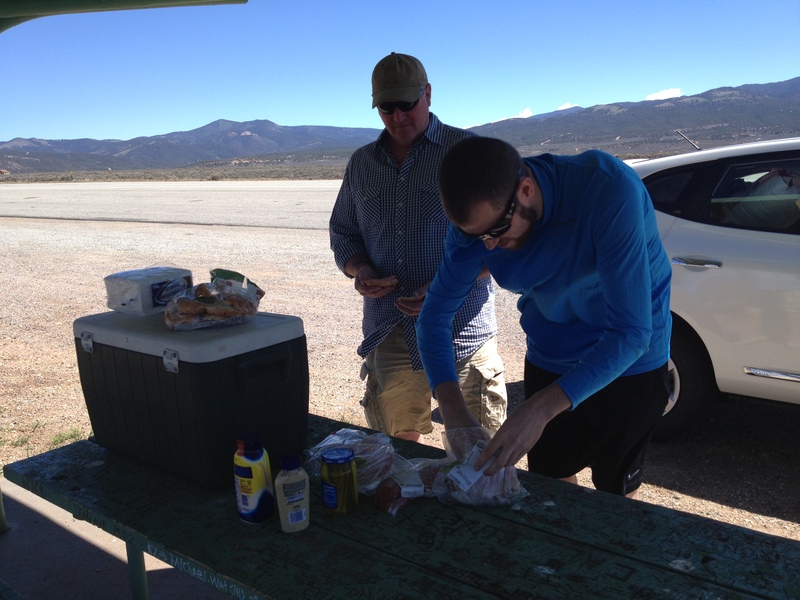 After we finished four-wheeeling we headed back to Durango, but first pulled over at a couple picnic tables to make sandwiches for lunch. Mama B. had a great idea to pack a cooler full of deli meats, cheese, and condiments to make sandwiches on our road trip! Not only did this save us money, but a majority of the time we were driving in the middle of nowhere with no restaurants in sight so this was a great idea for meals. 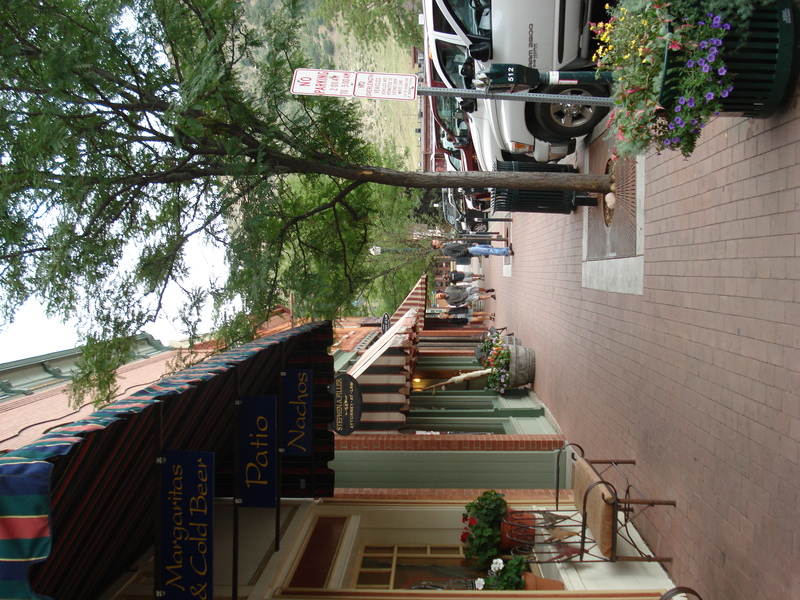 Durango was established in 1880 to serve the San Juan mining district. Silver and gold mining boomed in the late 1800s and Durango and other nearby towns, such as Silverton, grew immensely as people from all over arrived to work the mines and railroad. 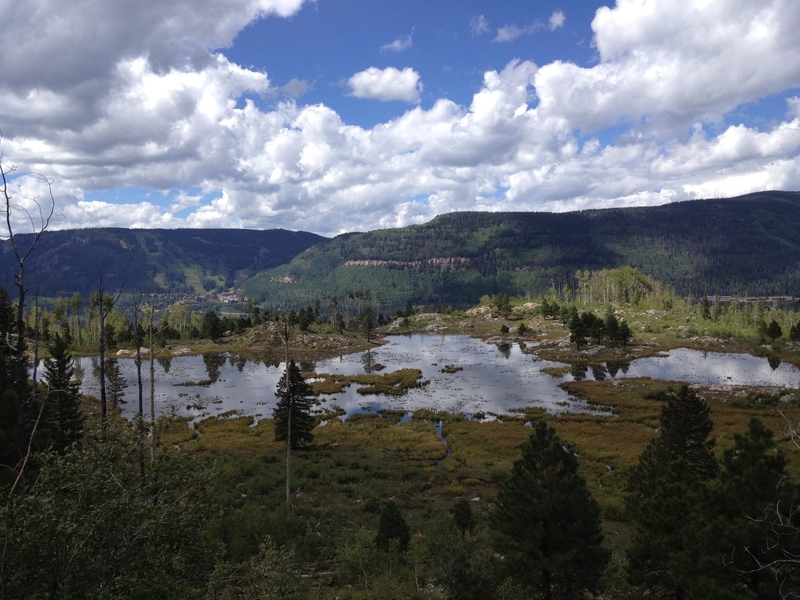 By the 1900s, Durango also became a vacation destination, with the creation of the San Juan National Forest in 1905 and Mesa Verde National Park in 1906. 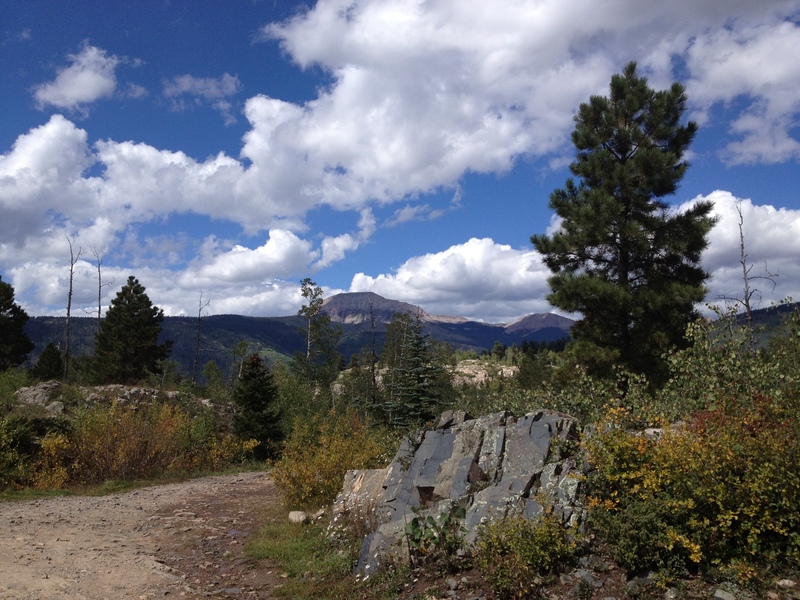 Today Durango is popular for its outdoor activities such as hiking, mountain biking, off-roading, rock climbing, hunting, fishing, kayaking and white water rafting. Another popular and historic activity in Durango is the Durango & Silverton Narrow Gauge Railroad. 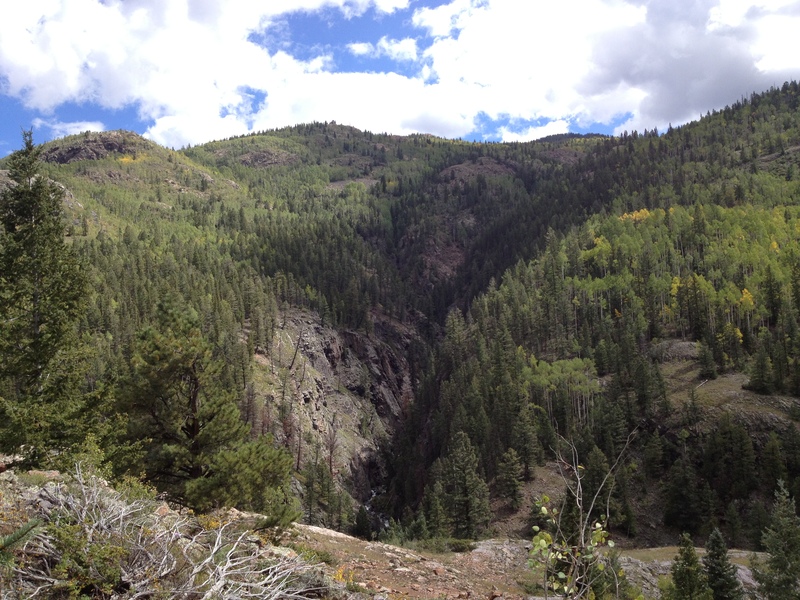 I have not done this, but it’s supposedly a gorgeous train ride through the mountains that departs from the preserved depot in downtown Durango. This heritage railway is a National Historic Landmark that travels 45 miles from Durango to Silverton on steam-powered trains with rolling stock dating back to the 1920s and earlier. This route was originally built in 1881 in order to carry supplies, people, and silver and gold ore from the mines in the San Juan Mountains. The last train to operate into Durango from the East was in 1968, but the line from Durango to Silverton has run continuously since 1881 with the use of steam locomotives, even if it’s just to carry tourists nowadays. 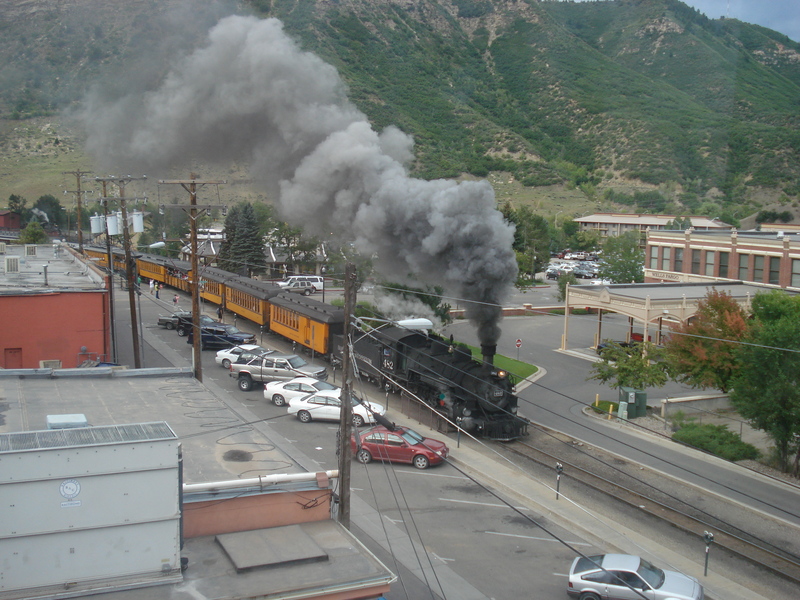 A steam locomotive returning to the depot in downtown Durango. 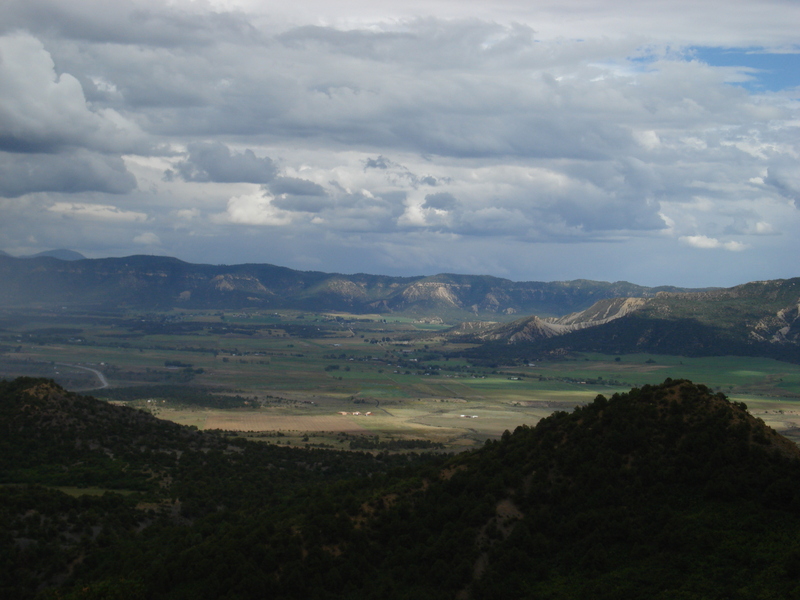 A view of the valley below on the way up the mountain to Mesa Verde. 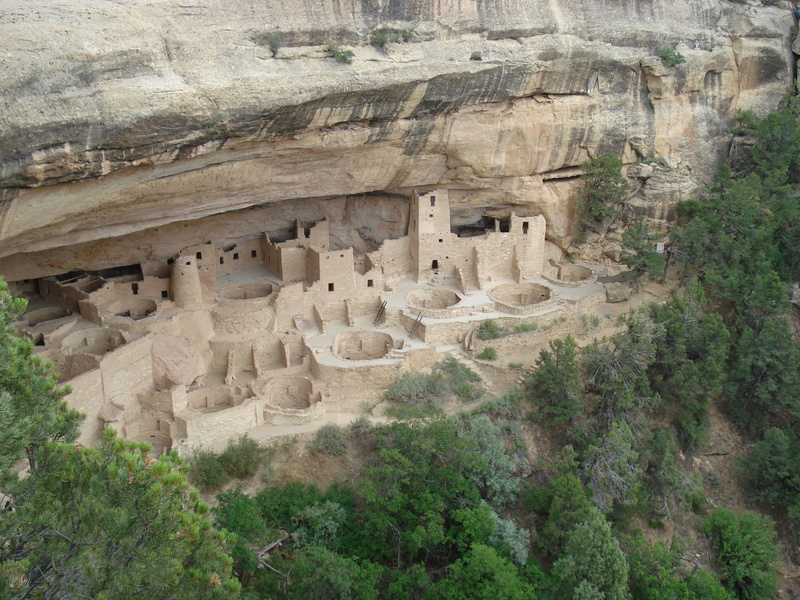 Mesa Verde National Park was established by President Theodore Roosevelt in 1906 to protect the 5,000 archaeological sites, including 600 cliff dwellings. Mesa Verde means “green table” in Spanish and the park offers a peek into the lives of the Puebloan people who lived in this area from 600 to 1300 A.D. This park includes some of the best preserved and most notable Puebloan sites in the U.S. 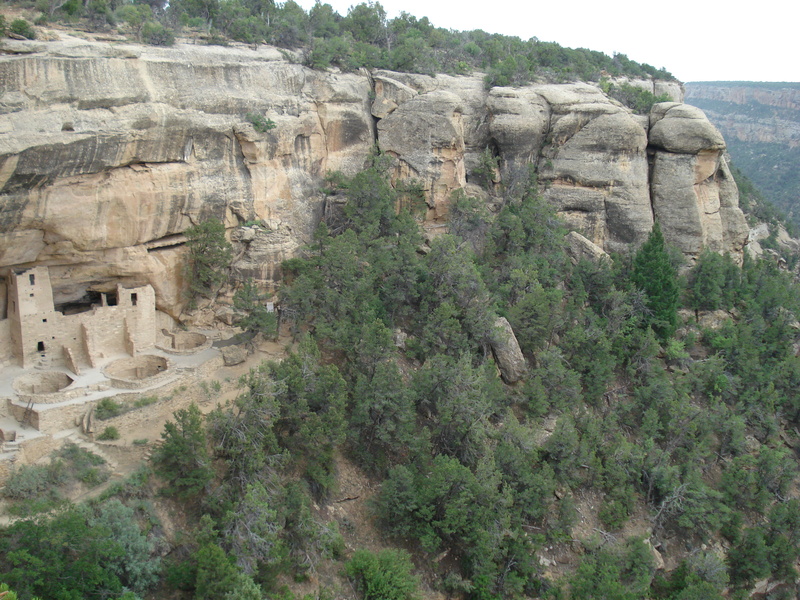 The most famous cliff dwelling at Mesa Verde is Cliff Palace. It is also the largest with 150 rooms, and an additional 75 open areas. 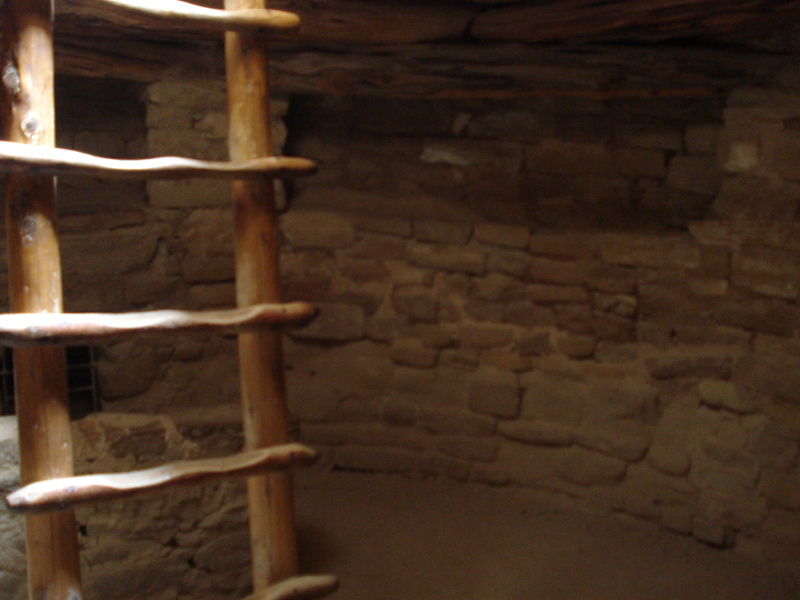 21 of these rooms are kivas, and 25 to 30 rooms are residences. 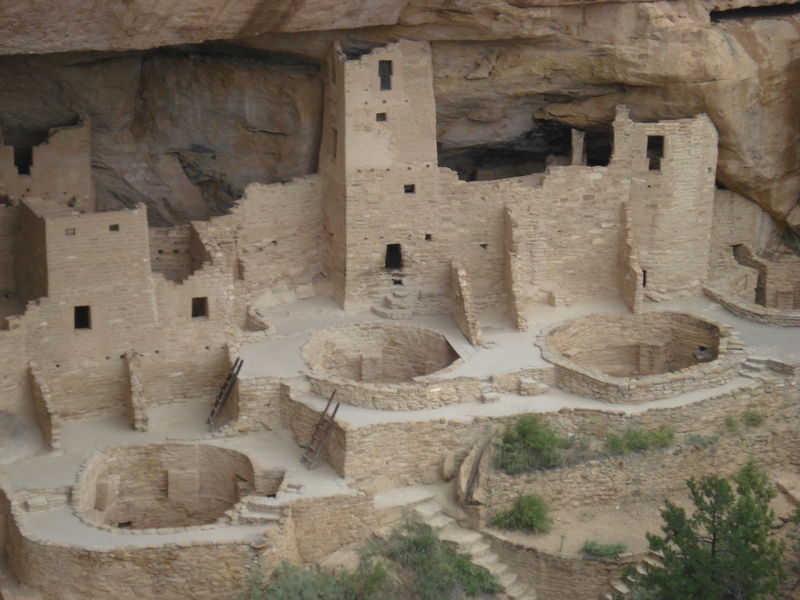 The number of Ancestral Puebloans living in Cliff Palace at any one time was 100 to 120. 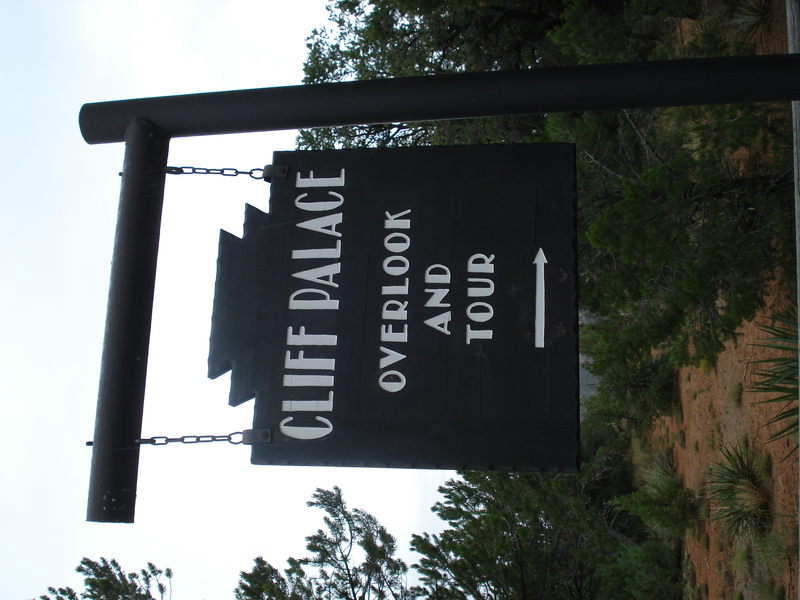 I highly recommend a visit to Cliff Palace. It is an impressive site, especially considering the dwellings are nearly a thousand years old! 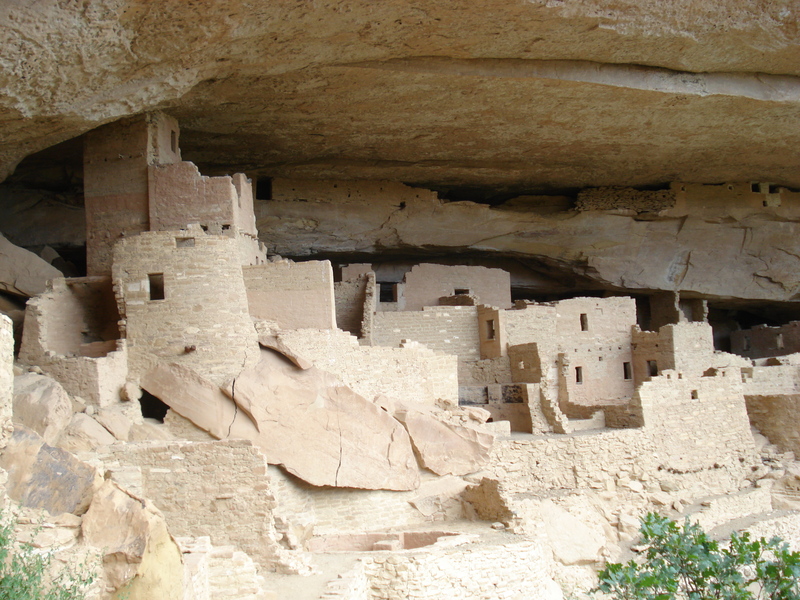 Cliff Palace is nestled in the canyons of Mesa Verde. 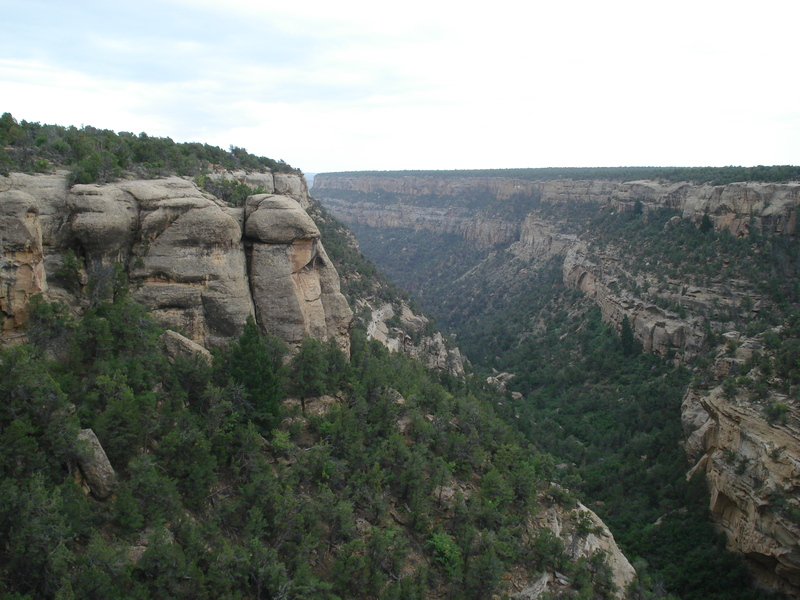 Four Corners is very near to Mesa Verde National Park. Visitors are allowed to go into some of the restored kivas. 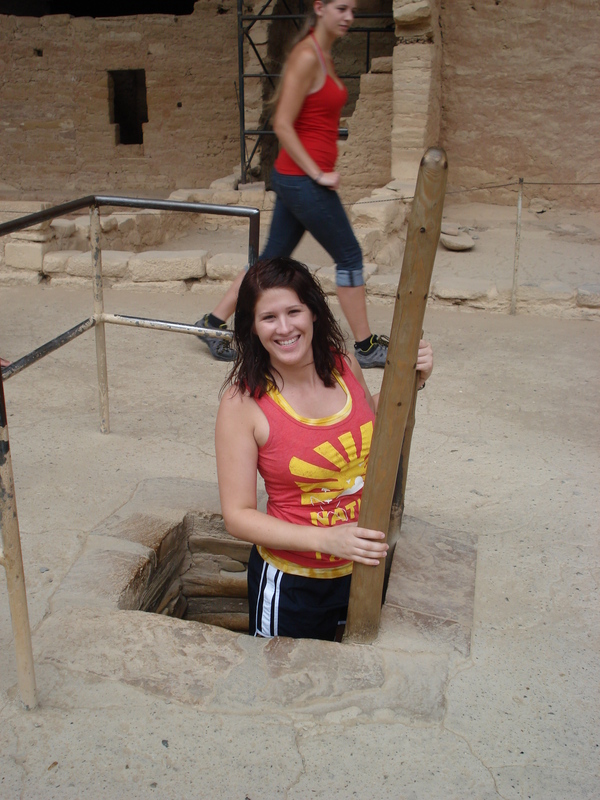 The inside of a kiva, which were rooms used by the Puebloans for religious rituals. 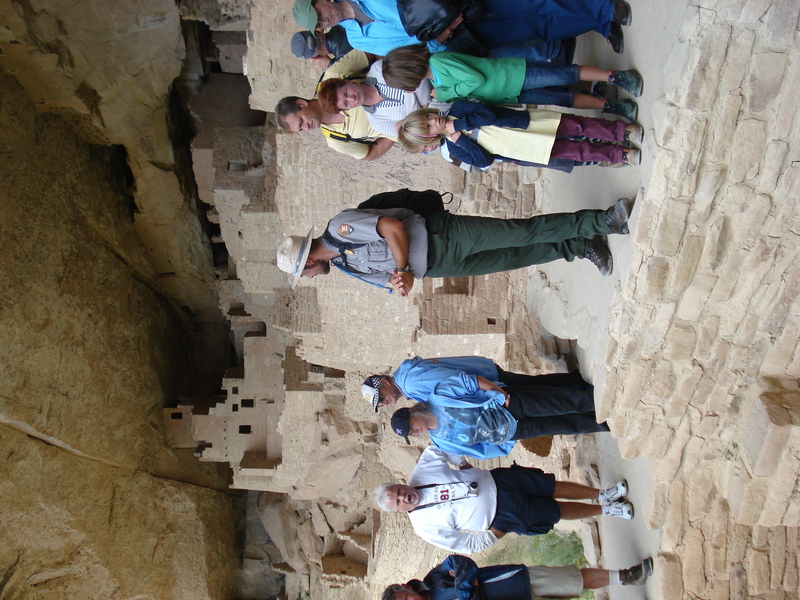 The park rangers provide the tours of Cliff Palace. 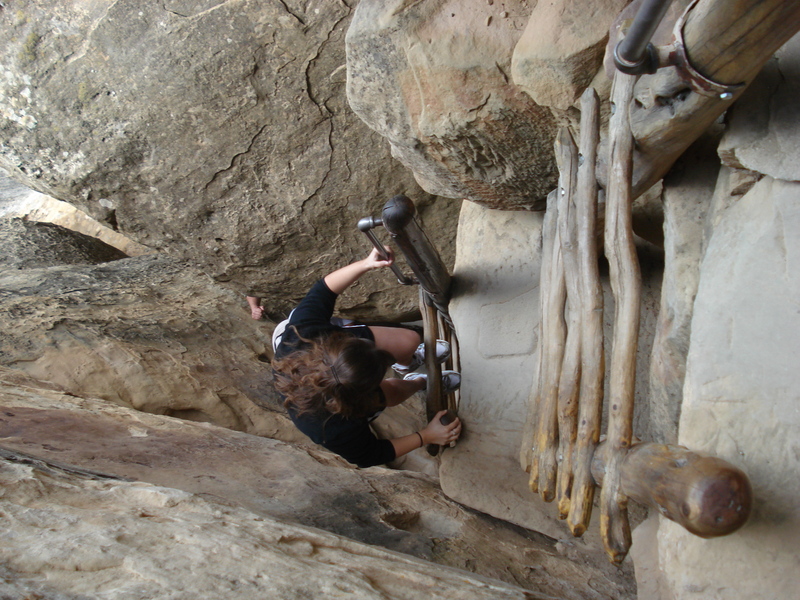 You do have to climb a few ladders to enter and exit the cliff dwellings, but it adds to the overall experience! 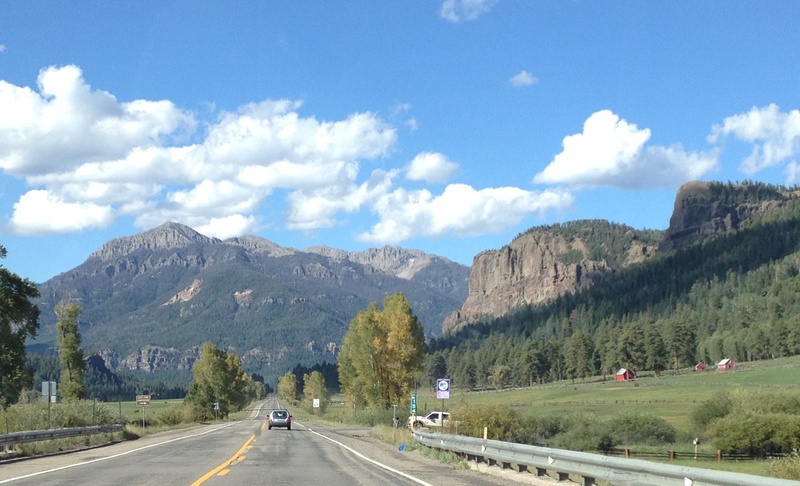 We left Durango in the afternoon to make the six hour drive northeast to Denver. 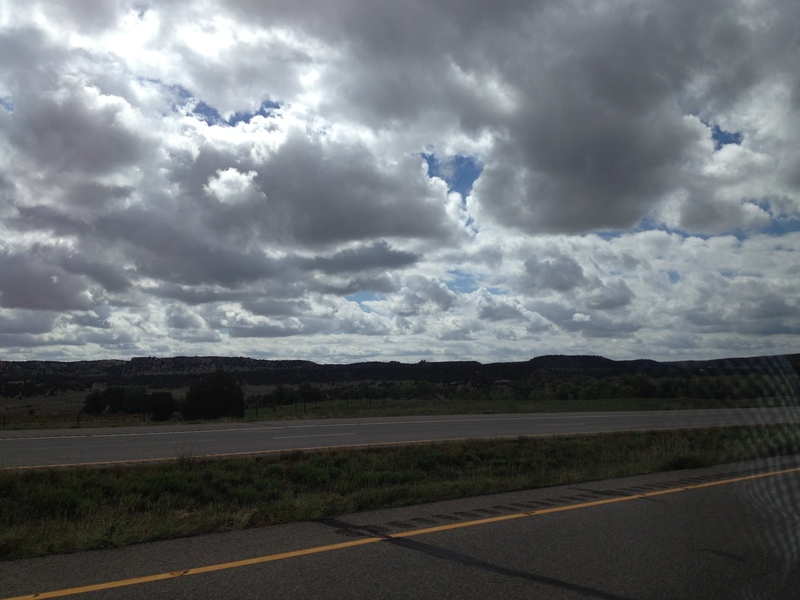 (We went all over the state of Colorado in our three days there!) 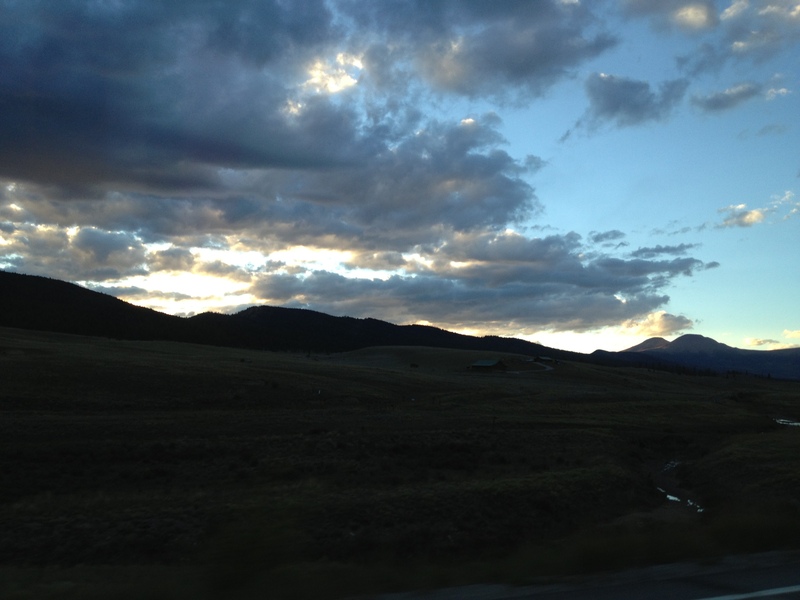 We drove up through the middle of the state to reach Denver and it was more gorgeous mountain scenery. 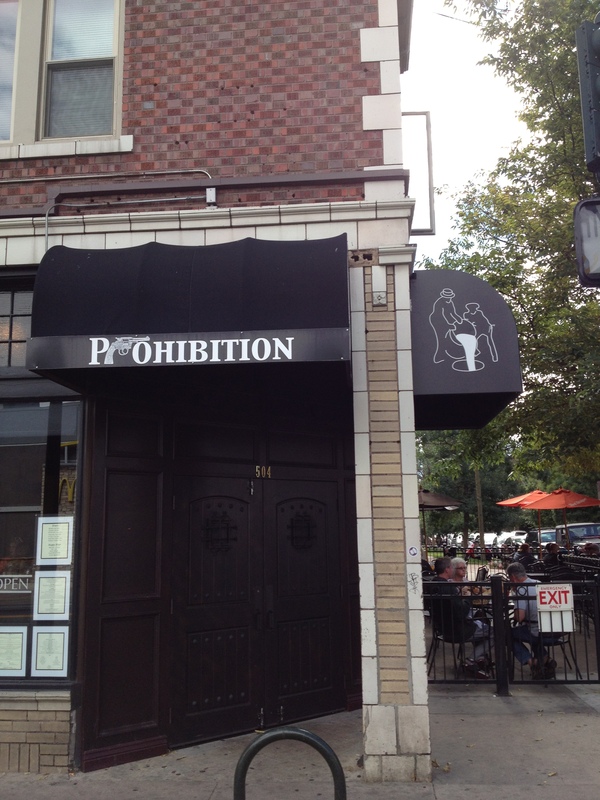 We arrived at our downtown Denver hotel in the late evening and crashed for the night. This was the first and only morning we had the chance to sleep in since we were spending the day in Denver. 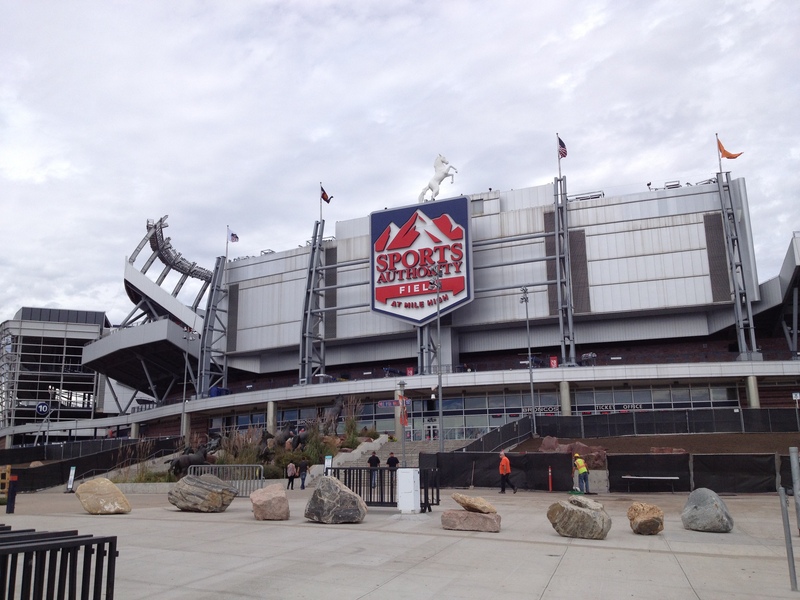 After breakfast we went to Mile High where the Broncos play. 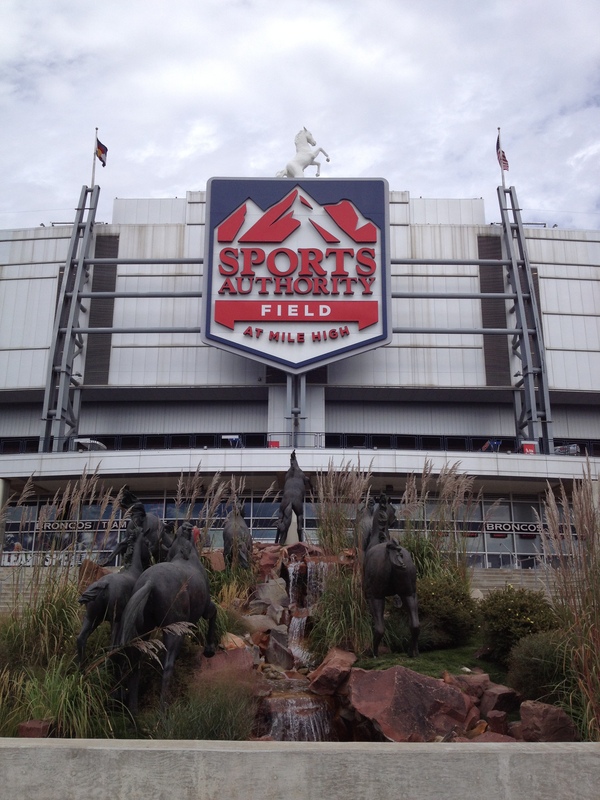 This is my brother’s favorite team so we couldn’t go to Denver without visiting the Broncos’ stadium. 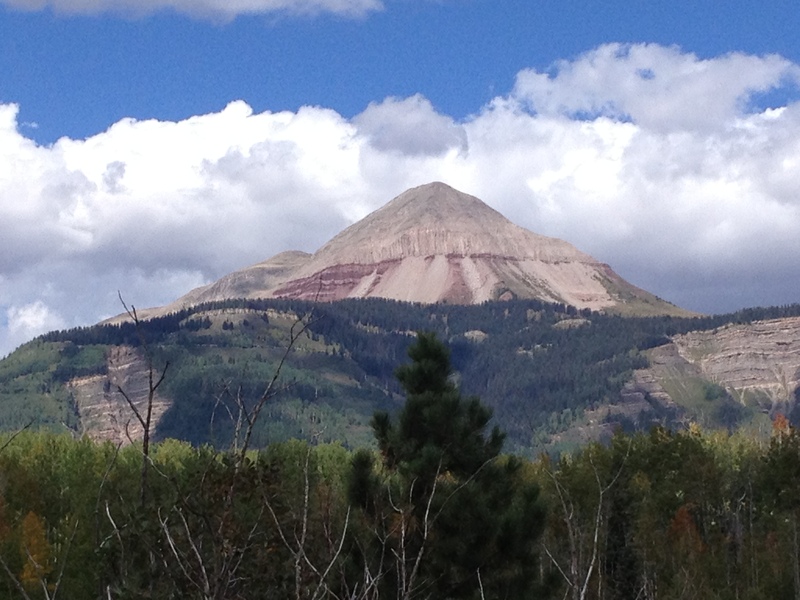 Leaving Durango and heading north to Denver. 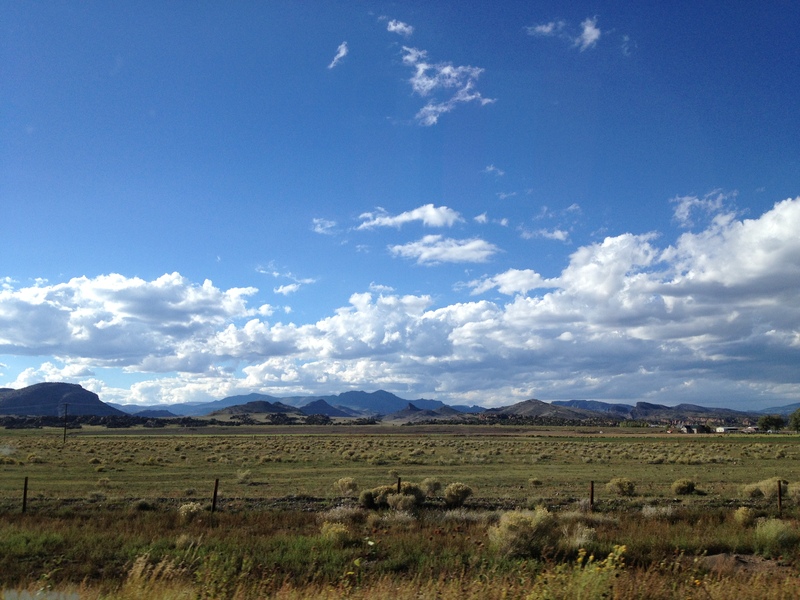 The countryside of central Colorado. Love the colors of dusk! 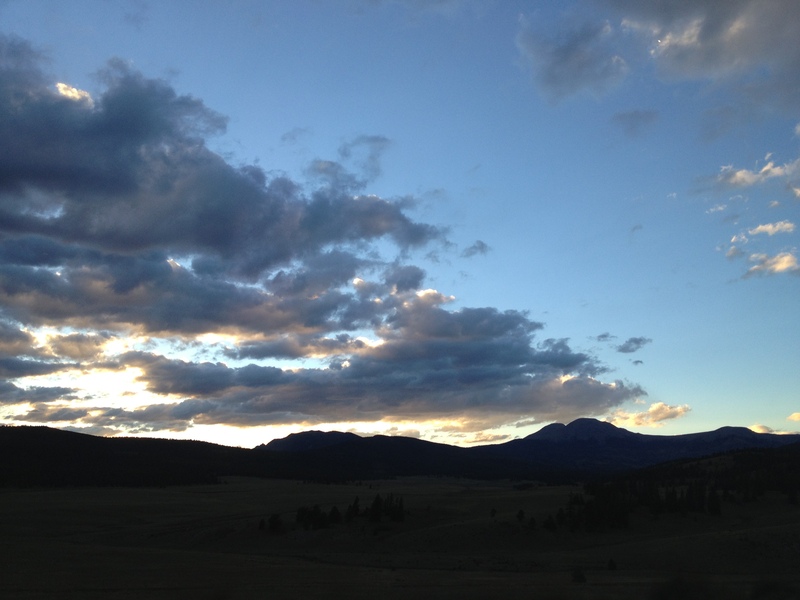 The sun sets early in the mountains so a good portion of our drive to Denver was at night. Although this is the Broncos’ Stadium (go Chiefs! 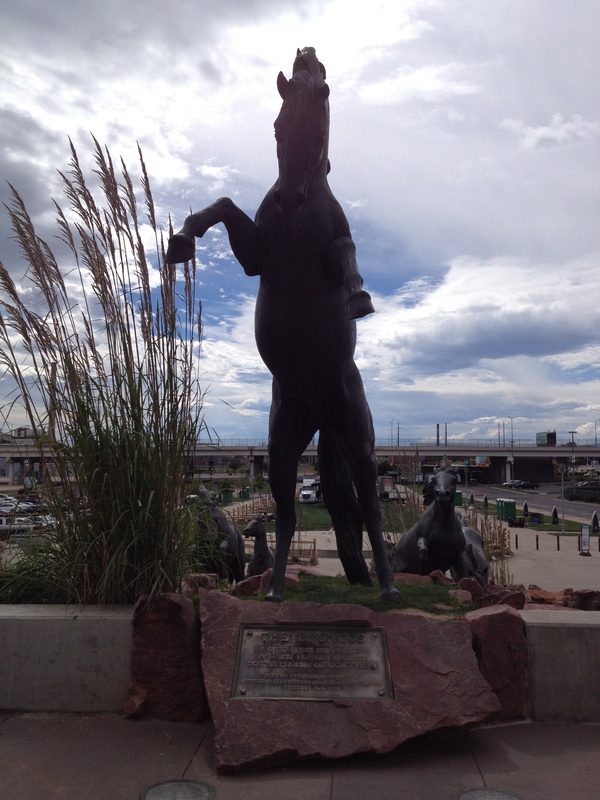 ), I have to say this statue is pretty awesome. Seriously, order the Short Rib Burger here. It is so good. 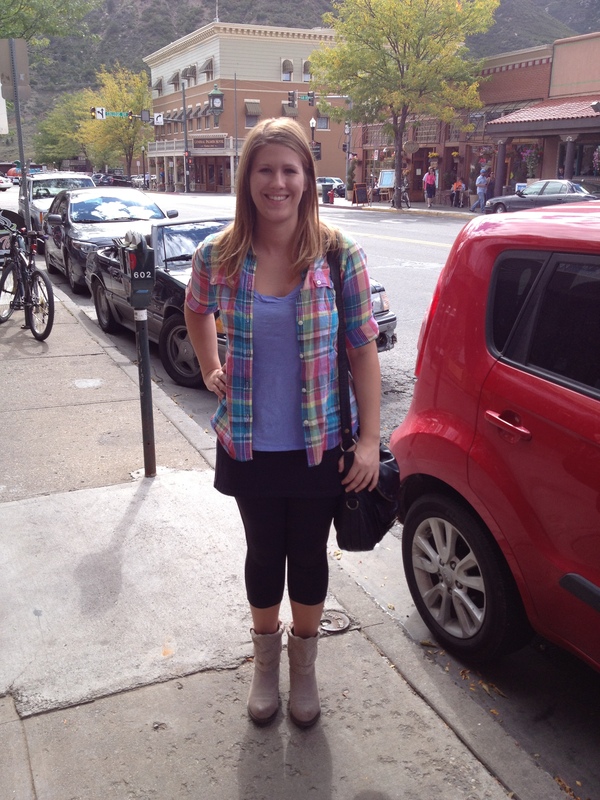 Next we spent the afternoon at Sixteenth Street Mall in downtown Denver, which features various shops and restaurants. We parked ourselves at The Titled Kilt bar to watch football and drink beer. This was the one of the times on our road trip that I really missed my mom…hours of football that did not even include my hometown Chiefs is not my favorite pastime, but we did have a nice time together. Sadly, we then had to take my brother to the Denver airport so that he could fly back home for his classes on Monday. After we dropped off my bro, Papa Kyle and I continued on to our next destination: Glenwood Springs, Colorado, where Doc Holiday is supposedly buried. It’s about a three hour drive from Denver and this was the only time we encountered bad weather the entire road trip. It started raining during our drive west through the Rockies and as we ascended to higher elevations it turned into snow for a little bit. But we made it safely to Glenwood Springs and checked into our hotel for the night. 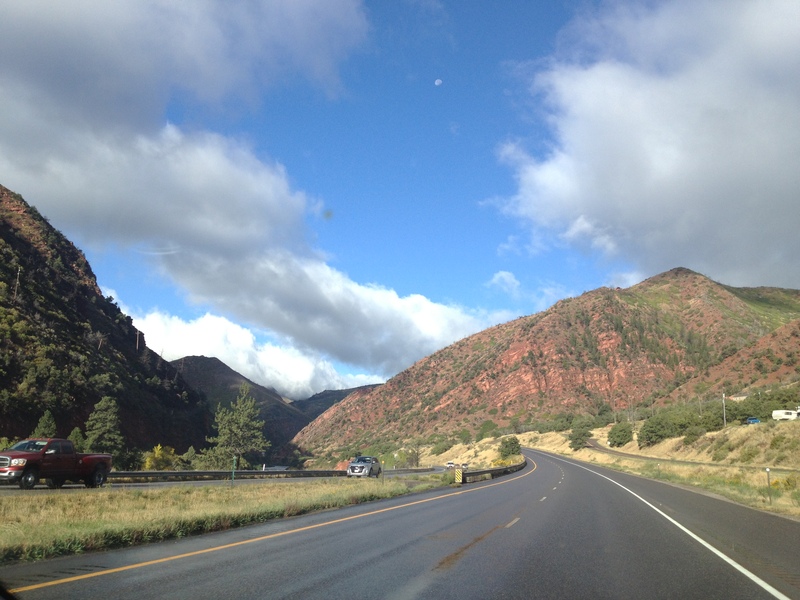 Our route from Durango to Denver to Glenwood Springs. 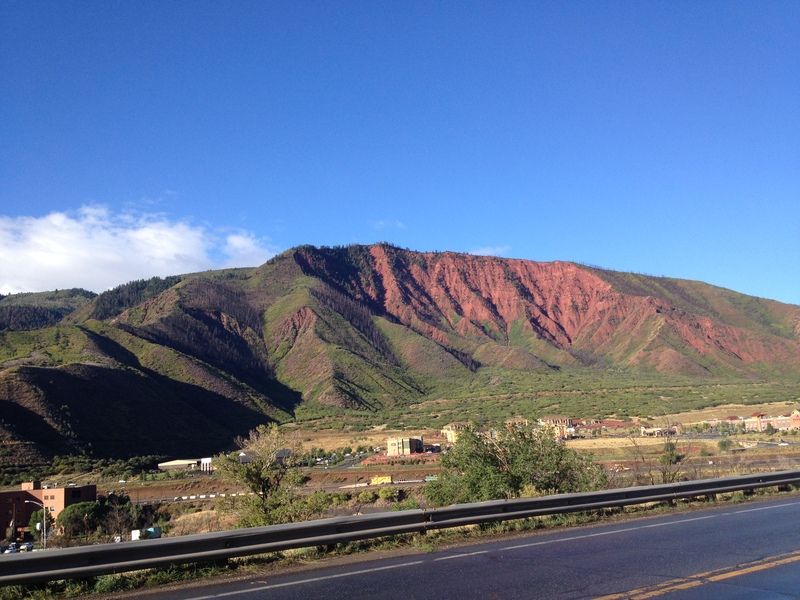 The colorful mountains near Glenwood Springs. Another beautiful day on our road trip! Goodbye Colorado, and hello Utah! In the morning we had planned on visiting Doc Holiday’s grave, but it turns out it is a rather strenuous hike to the cemetery and his grave is unmarked so no one is exactly sure which is his. 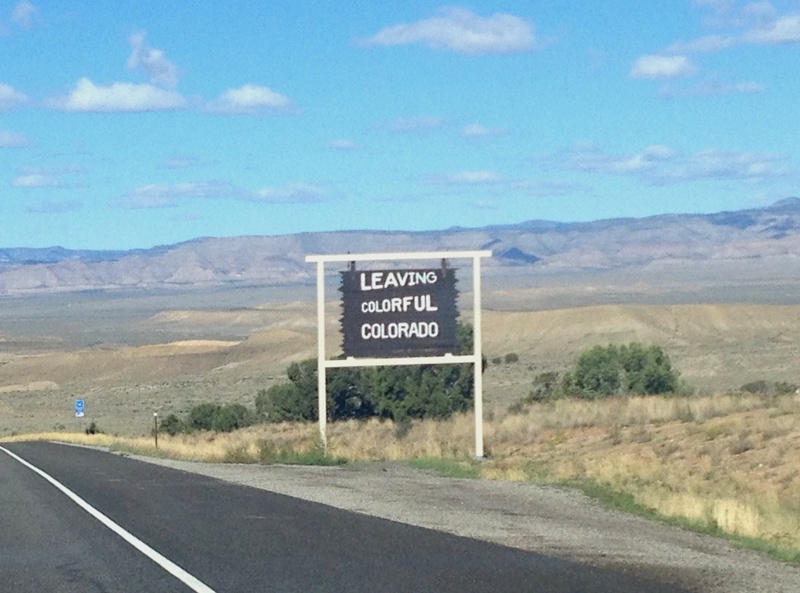 Thus dad and I decided to ditch that excursion and we continued heading west towards Utah. Absolutely fabulous babe! Can’t wait for the rest.